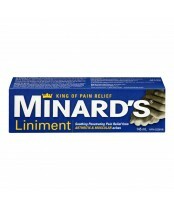 Minard's is the King of Pain Relief. Soothing penetrating pain relief from arthritis & muscular aches. Minard's Liniment is a pourable, white creamy rubbing lotion containing medicinal ingredients with a strong, penetrating odour. The potent smell dissipates quickly after application. The lotion is rubbed on liberally three or four times daily to the painful area. Minard's Liniment comes in an attractively shaped bottle true to its historic roots.